Chalk or rope to mark out the areas around the target. 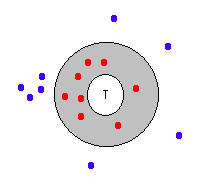 Mark two large concentric circles around the target (T), giving an area big enough for one team to play in without getting too close to the target post. Divide in teams. One team takes up the position of the defenders whose job it is to stop the target from being hit, but may only move within the boundary of the shaded area. The attacking team can move anywhere outside of this area and has the job of scoring by hitting the target. Change teams around after 3 hits have been scored. Encourage passing between team members. All attacks or passes intercepted by the defending team are thrown back to the outer area.